Do not panic....there is dessert at the end of this post!!! I am really excited to be part of Foodbuzz 24, 24, 24 this month. Foodbuzz 24, 24, 24 is an event where 24 food bloggers host 24 meals in 24 hours. The date just happened to fall when my sister was coming for a visit, so I thought I'd try updating a couple of my mom's recipes. Coming from a family that was extremely proud of our Irish roots, it may seem a little strange that one of my mom's "company dishes" was cabbage rolls and tabbouleh. According to my dad, this stems from a few steakhouses in Tulsa where they (and my grandparents and aunts and uncles) would eat. I remember growing up thinking these restaurants....Eddy's and Jamil's...must be so exotic. The children were never brought along and they served mysterious sounding dishes like tabbouleh, hummus and cabbage rolls. 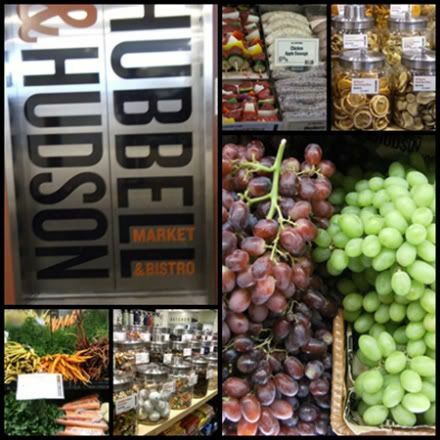 My meal adventure started at Hubbell & Hudson. It's a wonderful new-ish market in The Woodlands. If you are anywhere in north Houston, I strongly recommend making a trip. Even their produce section is drool-worthy...and I don't usually drool over veggies! So, we started our evening with hummus. This is a great recipe from Martha Stewart. I've made it several times and one wonderful thing about it is that you can make it ahead of time. We ate this with veggies and homemade pita bread. 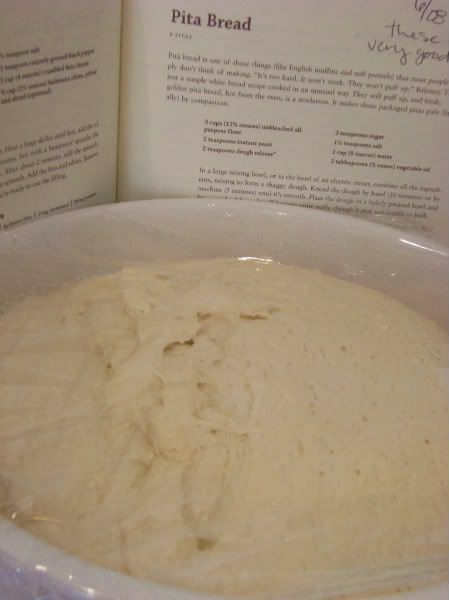 This recipe is from King Arthur Flour and is so easy and SO much better than store bought! To go with the cabbage rolls, there was tabbouleh. I don't know why I don't make this more, it's so fresh tasting and there's no heating up of the kitchen. 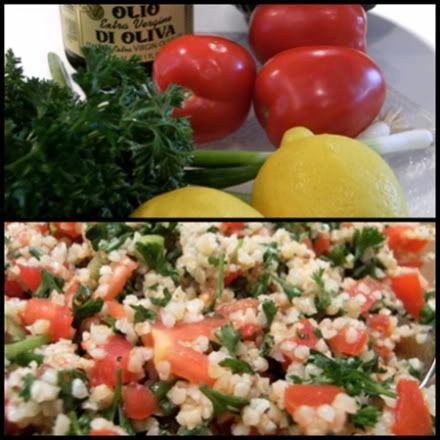 Unfortunately, I don't have my mom's recipe for tabbouleh, so the recipe is another goodie from Martha. I use curly parsley in mine because that's the way I remember it. :) My only tip is, make it several hours before serving to let the bulgar soak up the olive oil and lemon juice. Every time I see this recipe card, I crack up: MSG!!! Can you even buy it these days? Cook the cabbage leaves in boiling salted water for 5 minutes (add a few more leaves than you need in case of tearing). Drain. Rinse lightly under cold water. Mix the ground beef, salt/pepper, cinnamon, bell pepper, onion and rice with your hands in a mixing bowl. Fill each cabbage leaf with the meat mixture. Fold in edges and roll. Secure with a toothpick. In a large skillet, combine the sauce ingredients. Place the cabbage rolls in the sauce. Cover. Bring to a steaming point on med-high heat. Reduce to low and cook for 45 minutes. They were delicious! My dad went back for seconds and my husband had thirds! Even my 10-year-old who was a little hesitant about "cabbage rolls" liked them! I will make these more often! Thank you, Foodbuzz for letting me be a part of this month's 24, 24, 24! It was a treat! And thanks to my mom, for the great recipes and the inspiration! Great post and tribute to your mom's wonderful recipes! 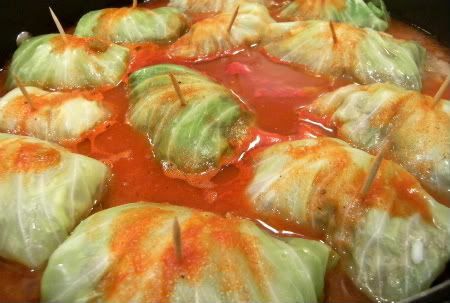 Those stuffed cabbage rolls look delish! I love your mom's cabbage rolls. The dessert looks great, too! 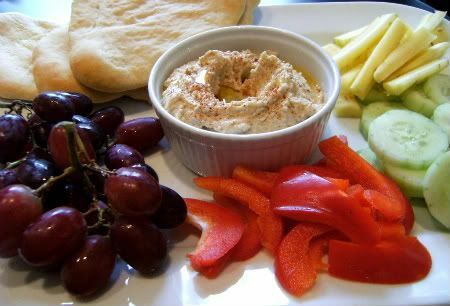 And the homemade pita bread and hummus: I say YUMMUS! And tart was excellent, even the single left over slice I had at breakfast. The "spice" Accent was MSG was it? Years ago? I think I remember my mom using it. Ingrid...you might be right! I remember Accent now! How funny! Thanks for the tip on the pita bread recipe. I hadn't looked it up but hubs and I were talking about this the other day. Need to try that out. everything was so good! I was glad I was here to enjoy it all!! most of our favorite recipes are from your mom. 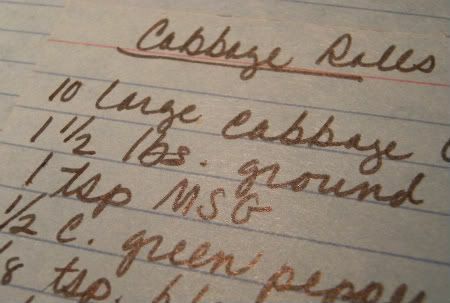 I'm so, so glad she taught me to make cabbage rolls....so, so long ago:) I'd like to try the pita. I'll bet you can still find MSG in Asian markets! Everything looks delicious. I have that tart recipe in my files. Great minds must think alike, eh? The food was terrific along with the company. it has been awhile since i made this, having it this weekend has inspired me to make it shortly. i love it. I am SO making the cabbage rolls for dinner this week. I have been craving them forever. I'm afraid of Accent though -- do you think it will be okay without it? BTW, my vanilla paste arrived intact. The cookie was in my tummy pretty much the moment I opened the box. It was really yummy and sooo pretty! I LOVE IT BRIDGET I WILL HAVE TO TRY THIS MINUS THE MSG AND I COMPLETELY FORGOT ABOUT BEING LEFT OUT OF SPECIAL DINNER NIGHTS. I REMEMBER BEING MAD ABOUT JAMIL'S HAHA! We'll echo everyone else by saying how great this post is. It's cool to do some of our family's recipes. The blueberry dessert is the fave though! Yum. Great 24 post! YUM! My tummy is growling! I didn't use the Accent...that's the main reason I updated it. I'm scared of it, too! ;) Just follow the posted updated recipe...it's really good! What a delicious meal to honor your Mom! I bet it meant a lot to share it with your sister and Dad! 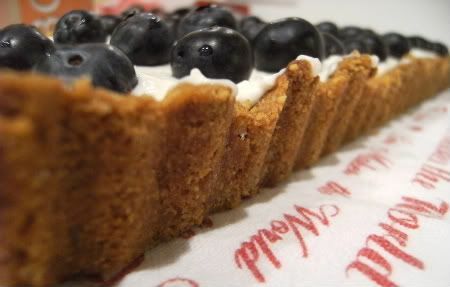 I was wondering how that blueberry/yogurt tart was. ooks like a good one for the summer. You made your own Pita? ?